It wasn’t particularly surprising to hear, but it’s now official. Last week, veteran infielder Craig Counsell decided it was time to call it a career, announcing his retirement. At the very least, he made the most of his talent. Despite a career OPS+ of 79 and never appearing in 110 games in a season until he was in his 30s, Counsell managed to play in 1,624 big league contests and participate in some of the game’s most memorable postseason series. Let’s take a bit of time here to review his career. Below is a list featuring the most important and greatest games he ever participated in, his personal highlights, milestones, achievements and lowlights. Also included are some oddities, memorable moments and teammates’ great performances he was on hand for. They’re all things he can claim to have seen or done. Here they are, arranged chronologically and broken up by what team he played for at the time. Sept. 17, 1995: Counsell makes his major leauge debut in a big win for the Marlins. Unfortunately, he isn’t playing for them yet. Counsell is a late-game replacement in a 17-0 demolition of the Rockies. Counsell grounds out in the bottom of the seventh. It’s one of only four games he ever plays for Colorado, and it’s his only plate appearance with them. Aug. 24, 1997: Counsell’s first career home run is a memorable one,—a grand slam. Not bad. It comes in the first inning off St. Louis’ Todd Stottlemyre. Sept. 17, 1997: Against his old team, Counsell kicks off a dramatic bottom of the ninth. With Colorado up, 6-5, Counsell singles for Florida to lead off the frame. He advances to third a little later but is thrown out at the plate on an infield grounder for the second out of the inning. A little later, with the bases loaded, Bobby Bonilla steps to the plate. He quickly gets two strikes against him, but then he fouls off five consecutive pitches before making good contact and hitting a walk-off grand slam home run for a 9-6 Marlins win. Sept. 30, 1997: NLDS Game One: With the score tied 1-1 entering the bottom of the ninth in the first postseason game of his life, Counsell singles to lead off. He makes it to third base, and the Marlins have the bases loaded with one out, but then Jeff Conine is force at home on a grounder to second. Immediately after that, however, Edgar Renteria drills a walk-off single for a 2-1 Marlins win over San Francisco. Oct. 1, 1997: NLDS Game Two: For the second straight day, it’s a walk-off postseason victory for the Marlins. This time, Counsell is readying himself in the on-deck circle when Moises Alou singles home Gary Sheffield for Florida’s 7-6 win. They’ll win the next game to complete the sweep. Oct. 14, 1997: NLCS Game Six: Florida wins its first franchise pennant with a 7–4 victory over the Braves. Counsell goes 2-for-4 with an intentional walk and strikeout in the effort. He also drives in two runs on the day. Oct. 26, 1997: World Series Game Seven: Counsell gets to live out the fantasy of any schoolboy. He comes to the plate in the bottom of the ninth in Game Seven of the World Series with his team trailing 2-1 and the tying run on third base. Against Cleveland’s star closer, Jose Mesa, Counsell hits a sacrifice fly to tie the game, 2-2. Florida wins two innings later with Counsell reaching base on an error and scoring the championship-clinching run. April 1, 1998: The world champion Florida Marlins may have sold off many of their best players in the offseason, but Counsell has had a nice start to his year. He tripled in yesterday’s season opener and does so again today. Florida loses, 10-3, to the Cubs, and that proves to be more indicative of the upcoming season than Counsell’s triples outburst. April 2, 1998: Counsell’s triples streak comes to an end with what WPA claims is the worst game of his life. As the Cubs top the Marlins, 8-7, Counsell is 0-for-3 with two walks and a whiff for an overall –0.414 WPA. His walks are unimportant, but some of his outs are killer. In the bottom of the seventh, he comes up with runners on the corners and one out with the game tied, 7-7. He flies out, and the lead runner is gunned down at the plate for an inning-ending double play. Two innings later, he comes to the plate with runners on second and third and strikes out to end the game. April 16, 1998: Counsell’s second career home run is just like the first one—a grand slam in the first inning. That’s right, each of his first career two homers come with the bases loaded. He’ll only do it once more in his career. July 24, 1998: According to WPA, this is Counsell’s best game. In fact, it might be the most amazing regular-season game Counsell ever plays in. The Marlins lose, 7-6, in a 12-inning contest in which the Phillies just refuse to die. Philadelphia scores twice in the ninth to tie it, and then when the Marlins score once in the top of the 10th, 11th, and 12th inning, Philadelphia matches them in the 10th and 11th, and then bests them with a pair of runs in the 12th. Counsell goes 3-for-5 with a 10th-inning solo home run, sacrifice hit, and three RBIs. His WPA on the day is 0.502. While it’s the best of his career, it’s only the second-highest in the game, as Philadelphia center fielder Doug Glanville has a 0.527 WPA in the wild contest. Aug. 3, 1998: In the bottom of the eighth, Houston pitcher C.J. Nitkowski loses his control, and Counsell pays the price. After Derrek Lee laces a leadoff single, Nitkowski plunks three consecutive batters. Counsell is the third plunked and the one hardest hit. He’s forced to leave the game and is injured so badly he won’t play again all season. May 31, 1999: Cliff Floyd blasts a two-run homer for the Marlins in the bottom of the fifth against St. Louis. Wait, check that. After initially signaling it was a home run, home plate umpire Frank Pulli opts to use TV replay to review the call. He reverses it, and Floyd’s homer is no more. Florida loses, 2-1. In the inning of Floyd’s non-homer, Counsell struck out two batters before Floyd came to the plate. July 3, 1999: LA is in a slump, having just lost their last four games. To break out of it, Counsell and his teammates burn some of their caps before today’s game against the Giants. They lose anyway, 9-1, with Counsell going 0-for-1 as a late-game replacement. Sept. 7, 1999: It’s the first all-Canada pitching duel in 26 years as Florida’s Canadian-born Ryan Dempster takes on fellow Maple Leaf flagger Eric Gagne of the Dodgers. LA loses, 2-1, with Counsell going 0-for-3 with a GIDP. March 25, 1999: Getting ready in spring training, Counsell’s teammate Randy Johnson kills a bird with a poorly timed flight pattern. He flies into the path of one of the Big Unit’s pitches. May 17, 2001: It just might be the worst game of Counsell’s career. He goes 0-for-4 with four strikeouts. It’s the only four-K game of his career. On the bright side, he also draws a walk. July 6, 2001: Almost. A’s starter Mark Mulder almost pitches a perfect game. After retiring the first 21 batters, he allows a single to Arizona’s teammate Danny Bautista, and that proves to be the only D’backs baserunner. As leadoff hitter, Counsell is the only Diamondback to come to the plate four times, and he goes 0-for-4. Oct. 4, 2001: The longest hitting streak of Counsel’s career peaks at 13 games. He goes 15-for-51 with four doubles in this stretch. His AVG/OBP/SLG is .294/.362/.373 in that period. Oct. 12, 2001: NLDS Game Three: Not normally much of a power hitter, Counsell has a rare moment of being the big man in the lineup, as he belts a three-run homer for Arizona in the top of the seventh. It proves to be the difference, as they beat the Cardinals, 5-3. Oct. 16, 2001: NLCS Game One: Arizona tops Atlanta, 2-0, and Counsell scores both of Arizona’s runs against Greg Maddux, singling in the first and doubling in the fifth. This game proves to be a harbinger, as Arizona wins the NLCS in five games. Oct. 27, 2001: World Series Game One: Counsell belts a first-inning home run off Mike Mussina to kick off what turns into a 9-1 Arizona rout of the Yankees. Oct. 31, 2001: World Series Game Four: It’s one of the most famous games in World Series history, as the Yankees tie it in the bottom of the ninth on a two-run Tino Martinez homer and then win it next inning on a Derek Jeter walk-off shot. For Counsell, it’s historic for a different reason. He ties a World Series record with a trio of sacrifice hits. Joe Tinker did it once in 1906, and Counsell here, and that’s it in the history of the Fall Classic. Consider this Exhibit A for why people have problems with Bob Brenly’s in-game managing decision. Counsell, for what it’s worth, never had two sacrifices in any regular-season game (let alone three) any time in his career. Nov. 1, 2001: World Series Game Five: For the second straight game, the Yankees tie it on a two-run homer in the bottom of the ninth and win it in extra innings. Counsell has a disappointing night, going 0-for-6 with two Ks. Most notably, he grounded to third with a runner on third and none out in the eighth, and that runner ended up dying at third. Nov. 4, 2001: World Series Game Seven: Once again, Counsell comes to the plate in the bottom of the ninth in a historic World Series game. This time, he’s facing Mariano Rivera with one out. Just before Counsell came up, shortstop Tony Womack doubled to tie the game, 2-2. Counsell keeps the rally alive by getting hit by a pitch to load the bases. Two pitches later, Luis Gonzalez hits a single to win the championship for Arizona. April 30, 2002: Playing third base, Counsell scores Arizona’s only run in a 10-1 Mets victory. With this win, Mets starting pitcher Al Leiter becomes the first hurler to defeat all 30 major league franchises. Aug. 3, 2002: For the only time in his career, Counsell belts a pinch hit homer. It’s a nice clutch one, too. It’s a solo shot that ties the score, 5-5, against the Mets in the ninth inning. Oh, and it came on a full count, too, against New York closer Armando Benitez. May 28, 2003: Counsell bats leadoff for Arizona in one of the best pitching duels of the 21st century. After nine innings, San Francisco and Arizona are tied, 0-0, with a combined four hits. Arizona’s Miguel Batista has allowed one hit and, opposing him, Jason Schmidt has allowed only three. Both pitchers are pulled in the 10th, and San Francisco scores for a 1-0 win. Counsell is 0-for-4. July 9, 2003: Counsell hits a home run for the second consecutive game. He never did that before and never does it again. April 23, 2004: For the first time in his big league career, Counsell laces a walk-off hit. He singles with the bases loaded in the bottom of the ninth against St. Louis in a game tied 1-1. The game ends, obviously, in a 2-1 Milwaukee victory. April 15, 2005: In the top of the eighth, Houston reliever Brandon Backe strikes out the side on nine pitches. The batters he fans are Bill Hall, Scott Podsednik and Counsell. Milwaukee wins anyway, 6-2. May 20, 2005: Normally no one’s idea of a power hitter, Counsell gets a trio of doubles in a 4-for-5 performance with a sacrifice fly and two RBIs as Arizona tops Detroit, 6-2. It’s the only time he ever gets three extra-base hits in a game. Aug. 7, 2005: It might be the greatest game of Counsell’s career. He goes 5-for-5 for the only time and scored three runs. Oh, he also steals three bases, also a personal best. He has a weird late peak on the bases. At the end of 2002, he was 32 years and six weeks old and had only 21 steals. Then he steals 69 more bases from 2003-06. May 19, 2006: For the second and last time, Counsell gets a walk-off hit to end the game. With the score tied, 9-9, and the bases loaded against Atlanta, Counsell singles for the 10-9 win. June 14, 2006: Counsell plays in his 1,000th career game, and he does it in style, going 3-for-5 and scoring a run. One thousand games? Not bad for someone who didn’t get his first real shot in the majors until he was 26 years old. Yet, he still has 600-plus more games left. Sept. 6, 2006: Congratulations Anibal Sanchez. On this day, the young Florida hurler no-hits Milwaukee for a 2-0 win. Counsell appears as a pinch hitter in the eighth inning and draws one of the four walks Sanchez surrenders. Immediately afterwards, Orlando Hudson hits into an inning-ending double play. June 12, 2007: For the second straight year, the Brewers are no-hit. This time it’s by Justin Verlander, who leads Detroit to a 4-0 win. Counsell goes 0-for-4 with two Ks. Sept. 9, 2007: Milwaukee makes history as Rickie Weeks, J.J. Hardy, and Ryan Braun begin the game with back-to-back-to-back home runs. With a nice, easy lead, they eventually bring in Counsell as a late-game pinch hitter. He fans, but Milwaukee wins, 10-5. Sept. 27, 2007: It’s one of the ugliest games in Milwaukee history. With the NL Central sitting there for the taking, the Brewers are melting down under manager Ned Yost. They’ve lost several games lately, and Yost has been ejected a few times in the last week. Tonight, they not only lose, 9-5, but they commit five errors in the process, leading to six unearned runs. Counsell appears as a pinch hitter, going 0-for-1 in the mess. The Brewers end up finishing second to a mediocre Cubs team in the division race. July 13, 2008: Earlier this year, CC Sabathia homered for the Indians in an interleague game, and today he goes deep for the Brewers. In doing so, he becomes the first pitcher to homer for a club in each league in one season since Earl Wilson did it in 1970. Despite that, later in the game, Milwaukee uses Counsell as a pinch hitter for Sabathia. Counsell gets an RBI sacrifice fly to help Milwaukee win, 4-3. Aug. 16, 2008: In the 1,256th game of his career, Counsell collects career hit No. 1,000. It comes as a single off LA’s Derek Lowe in the second inning. Counsell gets his 1,001st hit later in the game, too. Oct. 8, 2008: NLDS Game Two: For the only time in this postseason series against the Phillies, Counsell plays a complete game. He goes 0-for-4 with an RBI and a strikeout as Milwaukee falls, 5-2. Milwaukee will lose this series. It’s the first time Counsell plays in the postseason and doesn’t end up with a championship ring. July 29, 2009: Washington’s Josh Willingham steals the show, belting grand slams in consecutive innings (the fifth and sixth) against Milwaukee. He also doubles as the Nationals win, 14-6. Playing third, Counsell goes 1-for-5. April 18, 2010: It’s just like old times. Counsell does something he hasn’t done in a dozen years—belt a grand slam. It’s only his 40th career home run. He never did have much power. Sept. 7, 2010: Counsell is on hand when history is made. With him manning the shortstop position, Trevor Hoffman nails down a 4-2 win over the Cardinals for his 600th career save. He’s the first pitcher to reach the 600-save marker. April 19, 2011: Let’s see if the old dog can do a new trick. In the bottom of the eighth, the 40-year-old Counsell is put in left field. It’s the only time he ever plays the outfield in his big-league career. He doesn’t have to make any plays out there. Sept. 17, 2011: For the last time, Counsell plays a full game. He goes 1-for-3 with a walk and two runs in a nice 10-1 Brewer win over the Reds. 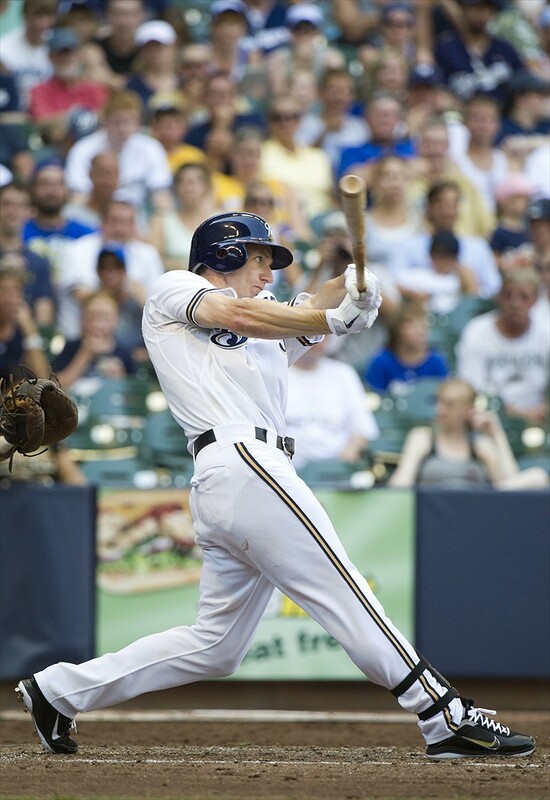 Sept. 28, 2011: Counsell is a late-game replacement in a 7-3 Brewer win over the Pirates. It’s the last game of Counsel’s career—well, last regular-season game anyway, as Milwaukee will play in the postseason this year. An inning before Counsell enters the game, Prince Fielder makes an odd sort of history. He steps to the plate with a .299 batting average on the season—and draws a walk. He’s the only person to qualify for the batting title, bat exactly .299 and draw a walk in his final regular-season plate appearance. All the other guys swung for it in an effort to make it to .300. Oct. 7, 2011: NLDS Game Five: Once again, Counsell comes to the plate late in a winner-takes-all postseason game. He appears as a pinch hitter to lead off the bottom of the ninth in a game tied, 2-2, against Arizona. Counsell lines out, but a little later, Milwaukee scores to win 3-2 and advance to the NLCS. Oct. 16, 2011: NLCS Game Six: Counsell makes his final appearance in a big-league game. He comes to the plate as a pinch hitter in the bottom of the seventh with Milwaukee trailing the Cardinals, 11-6. Counsell grounds out back to the pitcher, and that ends his career. The Sanchez no-hitter came when he was with Arizona. It’s misfiled w/ the wrong team in the article above. D’OH!